Real samurais were cats. Who knew? Thanks Mr. Rogers for clearing up this historical inaccuracy. I originally read this nearly thirty years ago when I was in college. I was just discovering humor in science fiction and fantasy literature, and this was a rare find: a book that parodied the nerd classics. Tolkien, Lovecraft, Conan, and Norse mythology are skewered mercilessly, and this book (and its sequels) found a place among my favorites. Rereading them again, the jokes feel a little clunkier than I recall, and the author seems to find far too much glee in describing the disemboweling of the title character's enemies. The book is also chock-full of crude illustrations done by the author himself, making the book almost a graphic novel, but not really (although the "maps" at the beginning of each chapter are still pretty funny).The character of Miaowara Tomokato, the titular Samurai Cat is the best part. He maintains a civilized singular focus throughout the adventures, in spite of the insane situations around him. Although author Mark E. Rogers layers bad puns on top of wahoo scenarios and blistering send ups of nerd cliches, he always plays Tomokato straight. My rating is mostly because of nostalgia, but I would highly recommended this book for anyone looking for a book that lovingly pokes fun at cherished geek classics. Miaowara Tomokato is the Samurai Cat, on a mission of vengeance to hunt down those who had murdered his lord. Tomokato is the focused constant through many crazy encounters on his mission. Full of puns, parodies and silliness hitting on Tolkien to Norse mythology. Overall it was a fun read, but probably not for everyone. This was really more of a 2.5 stars for me. I really loved the illustrations included in this novel - cats as samurais in the old Japanese scroll style - and expected for it to be more historical with a little humorous twist. In this end, much of this was a parody of famous science-fiction and horror writers, namely H.P. 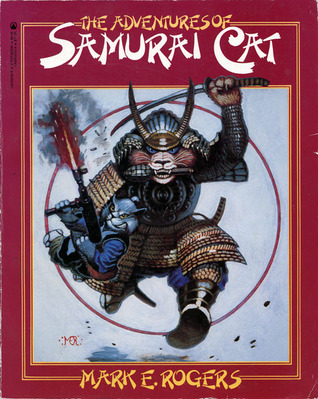 Lovecraft, and while I love a good Lovecraftian parody, I just thought that the concept of a samurai cat had a lot of potential and the whole book was kind of a cop-out. I will give the author credit for his writing style; it's obvious he's read Tale of Genji and other samurai literature - so, props for that.Also, while there are illustrations, that alone does not make it a graphic novel, ok? - much of it is standard novel format. Don't be fooled. First book of genreathon. What a stud! I LOOOOOVED this book, so wonderful so hilarious but also an amazing epic fantasy adventure. Shiro is actually that best character in any book I have ever read ever. K'Chu and Bl'syu had me laughing for hours simply because of there names. I wish I could give in more than five stars, but Goodreads has its limits. "I wish we were being lead by someone like that' What a Stud." What a stud!What is it about science fiction writers and bad puns? I call to mind Callahan's Crosstime Saloon and the Mythadventure series. The natives had dangerous numbers on their side...Bob got hit in the head with a Nine. It's a good thing I like bad puns.All in all, a fun book on can use to turn your brain off. This was the super greatest book ever in middle school. So I read it again for the heck of it. While a cat that is a samurai is no longer the most profound thing I can imagine, I did get many references that flew by me as a kid. All-in-all reasonably entertaining absurd fantasy humor and a great trip down memory lane. Simply the very best illustrated feudal Japan/sci-fi/fantasy/adventure parody featuring a feline protagonist ever! Absolutely great! If you don't agree, you're wrong. First read this when I was 14 - I laughed myself silly then and I still do today every time I read it. Amusing! I don't usually go for this kind of humor, but this was well executed. And the drawings are great. Mark E. Rogers - Mark E. Rogers was an American author and illustrator.